Anand Mehrotra is a modern Indian yogi and guru who grew up in Rishikesh, India, the birthplace of yoga. Despite the looming burden of a Vedic prophecy predicting his death in an accident, he fearlessly leads a group of students on a journey of a lifetime towards the highest motorable road on earth. 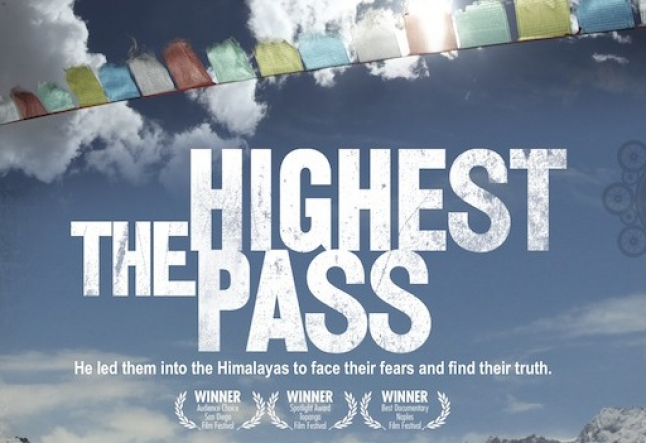 The inspiring film, The Highest Pass, documents the 21 day motorcycle expedition through the passes of the Indian Himalayas. At over 18,000ft., this journey along the sheer, icy edges of the Himalayan cliffs leads the riders to isolated mountain lakes, ancient monasteries, a mystic oracle and ultimately a deeper understanding of themselves. We had the opportunity to ask Anand some questions about the purpose of the journey, his teachings and his mission. YT: Do many Indians know the time of their death? How has awareness of your own time of death affected the way you live your life? Anand Mehrotra: Traditionally, the Indian people do not know their time of death. Secondly, it’s not something the astrologers are taught to focus on. But, in my case, it was a unique thing in the chart. There was an energy the astrologer saw and he was a very old master and he saw it as either death or awakening. It’s very important for human beings to contemplate our movement towards death in every moment. When we are really aware of our annulment, then there is an immense shift in the valuation of life; what you give your attention to. So we must realize the certainty of death, the uncertainty of the time and what will stick with you. Humanity collectively lives in a denial of death. In my case, I had a beautiful gift of a master bringing it forward. So it shifts your attention from denial to acceptance. To presence and acknowledgment. Death is part of life. It, for me, has been a very conscious presence to not waste time on unnecessary things in life. To not seek safety and security or seek accolades and medals. To not try to please or live from ego, because the ego’s time here is very limited and it will be annihilated. So why waste your precious time here preserving or living through that? So I choose to live in freedom. Then you become aware of what is of value. When you are aware of this then there is an awareness of what you give your attention to. And my attention has been given to that evolution and alchemy of the true nature of self. So when death arrives it is an immense celebration and nothing more, because in this moment we are dying. Only the true self shall never be dead. We must come to an understanding of that. YT: In the film, your teacher said that you were curious like other children but unique because you always wanted to spend time with the yogis. What interested you about them as a child? What was your path to becoming a guru? Anand Mehrotra: What attracted me was the mystical nature and an intoxicating madness. I was very intuitive as a kid and still continue to be. I was attracted to those with a fierce presence to them, out of the mind, out of the ordinary. I wanted to experience the extraordinary. I was not interested in the mundane or in becoming somebody. I wanted to partake in that mystical experience, to be touched by that Shakti. That’s what I did. And from a young age I had a deep desire to be with the yogis and it never stopped. A thirst for freedom, for alchemy. That has been a driving force in my life, and then to make it accessible to people who I cross paths with; that has been my passion. I have had such opportunities to be in the mountains in deep meditation, in nature, and with great awakened beings that have served as immense pointers to the location of the infinite ocean of bliss that resides within. A student first and a master second. Only with that awareness can we keep deepening the awareness of self. YT: Most people spend their lives trying to escape death, yet we see you rushed to meet it. What was your motivation for taking the motorcycle journey through the Himalayas? Anand Mehrotra: I want people to understand that you cannot escape death. You cannot. Does anybody escape death? Did the Buddha? Did Alexander the Great? Has anyone? Where are we trying to run and what are we trying to protect and hold onto? This kind of madness called life creates conflict. So it’s not running to meet death, it is an expression of love. The movement occurs through love. The way fear makes you move is not movement at all. It is stagnation and regression; back into the cave, never moving forward into expansion. Expansion is to be shared. Joy grows when you share it. Love grows when you share it. Wisdom grows when you share it. So rushing to meet death is a love affair. I was not going to die. Die now so you can live. Die to inner conflict. Die to fragmentation. That must die so we can truly live now. When we try to escape death we are using our life as waiting room. That is not living. It is a psychological fear and denial. We have religions based on that fear, promising you afterlife. In the movie it is really about realizing what is a true you, the eternal self. Never born, never dead. Always here. This journey is to realize that. YT: As a teacher, what kind of responsibility do you feel when you take on a new student? Anand Mehrotra: The job of the teacher is to lead a student to themselves, not to you. But let’s first look at the word “responsibility.” In our culture it often comes with the idea of burden, a weight, that you are carrying somebody. In my understanding, responsibility is standing up for something transcendental, something beyond the human understanding. I look at is an opportunity. It is an opportunity for alchemy. My commitment is of my being, and it is to really give an opportunity to his or her true nature. I do not feel a distinction between me and the student, we are part of the same field. There is no other, there is just the self. It’s a great opportunity for me to share through the channel. You know, what I can offer on a teaching level and what I can create in terms of an awakening in their deep capacity. And it’s not a very frosting-filled path! Often times it might bring up a lot of fear and negative emotions in the student. But there is a commitment on my part to not take it personally and to stay present and to look into the soul of them. The student is there to awaken. It might be challenging, but really only challenging to the way of thinking or the conditioning. So it might bring up fear, but the undertone is opportunity for transformation; a deep love, a deep excitement of radical transformation. It is a celebration of the student. And this is all part of me and I am very clear why I am here. They are deeply responsible for their freedom. I can only create opportunity. There is no blame. When you become a student with me, you are not giving power to me, you are accepting your power. It is the beginning of an arrow to their true power. An awakening of their responsilbity. YT: Many of the riders were inexperienced and ill-prepared for such a challenging and dangerous journey. How did you feel about taking their lives into your hands. Anand Mehrotra: The question comes from a linear way of thinking. Journey is a metaphor of life. Do you ever come into this life and already know how to live and already know how to love? Do you learn it in the linear pattern of time? Does the linear knowledge that you get, serve you? Or perhaps the linear knowledge you accumulate is the very thing keeping you from learning. If you look at the immense scientific discoveries and high points of creative expressions of human history, they have always been from a place of no thought, of Satori. These guys like Einstein have been very mystical in their approach, thus the word insight. There is an awakening in the moment. When the riders were there, I knew of the capacities beyond their mind. I knew that the only thing in their way on this journey was their mind. On linear time they didn’t have the accumulated information, but beyond their mind they knew it all. That’s why you see in the movie that despite their self doubt, in spite of their fears that come up, they all go beyond it. They all come to a realization that they were far more capable than they thought. That is the purpose of the teacher, to see in that student what they might not be able to see in themselves. To have that trust in them, that they can rise to the occasion. That’s what the point of life is. If we keep waiting, it will never be here. When will you live? When will you dance and be free? And then people will say that they do not know how to be free or that they do not have enough skill to be free… but freedom is not a skill. So that’s what the journey was about, to tap into that radical freedom in you. That deep capacity in you that can do anything irrespective of the accumulated information you have in your brain or not. That you can tap into the quantum mind of the cosmos. If any human can do it, you can do it, because you are a human being that is part of that same shared space. I was very clear of who would make it, irrespective of their skill set on a quantum level. I was clear that if they got out of their own way, they would all be able to do it. This was not a show of how macho or how skilled. This was not a journey to prove your skill. This was a journey to awaken to your true nature, your own potentiality, your own capacity. Not a battle. A journey. The highest pass is within you and all this journey is to realize that. And sometimes the very thing that keeps you from that highest pass is your skill. YT: You could have chosen easier, safer roads on the journey. You could have waited for mountain passes to be officially opened before forging ahead, etc. Why did you take so many risks? Anand Mehrotra: Because I enjoy it. For me they are not risks. I do not look at life as risks. I am in love with life, so where are the risks? The more security you seek in life, the more insecure you are. The more you try to be in control in life, the more violent you are. So there are not risks. It’s just an expansion and opportunity to play in the heart of the divine. To a mundane mind it might seem like risks, very subjective. And, when you are going to the Highest Pass, you have to go through the Highest Pass. You can’t call it The Highest Pass and go through the lowest pass. When you show up 110% there is no easy or difficult. Yes you may find some things challenging, but those challenges are there to reveal your true nature, not to scare you. You may get scared, but that is the mind. The purpose of the challenge though is to reveal true nature. To realize this is who I am. And when you go with me, giving up is not an option. No turning back. I always say in life that you can live free or die trying to be safe. When you are in the mind everything looks like a risk. The only reason for the hunger of the stomach on this planet is because of the hunger of the mind. And the mind is hungry because the mind is afraid and is looking at life as a risk. Taught since children to look at life as a problem. So we are constantly existing in a state of threat, because we see life as risk. We have an idea of how circumstantial reality needs to be for me to feel a certain way. And when circumstance shifts we get into a triggered and see it as risk. We then go into conflict and then seek to control. So look at our world. That’s what keeps on happening. Risk is contractive. Opportunity is an expansion. I invite you to look at it this way and see what it does for you. YT: You said that knowledge is an obstacle to freedom. Can you explain what you meant? Anand Mehrotra: The truth exists beyond knowledge. And sometimes when we have this idea of life then we are not present to life, we are only agreeing or disagreeing with life. That’s why kids can learn things faster than grown-ups. Because as we grow up, we get into an idea of knowing. So we become the same old, same old… nothing awakening , just the same repetitive pattern… why is it repetitive? Because somewhere we think we know and are not allowing expansion. We use limited accumulated information, which is ideology. If it’s outside comfort zone we shut it out or fight it. And then we are not accessing awareness. Not expansive. Not free. If you were wearing red glasses then the world would appear red, would it not? If you think you are seeing the true world, then you are in trouble. Now for you to even begin to see the true world you need to be able think that maybe you aren’t seeing it all. So let me pause and take off the red glasses. And you awaken to the whole world, the multiplicity of the world. YT: Freedom from suffering is a primary aim of yoga practice, what else do you see as an obstacle to that freedom? Anand Mehrotra: Yoga means unity, and all suffering is from disconnect. Disconnected from source and true self. When disconnected from the unconditional source of love, there is suffering. Yoga is the end of suffering. Yoga is love, it is connection. So one of the biggest obstacles to freedom is disconnection. You get disconnected from love and somewhere you start living your life as a threat. Then you get caught in the four movements of the ego: Staying in disconnect. Seeking control. Seeking security. Seeking validation. Then one of the biggest obstacles to freedom is unwillingness. This apathy, this lack of attention. In the Gita it is said that the first supreme requirement for freedom is immense willingness and desire. YT: Your teacher said, “Awareness can transcend prophecy.” What does awareness mean? Do you believe that it was by your awareness or by “crazy grace,” as it said on your helmet, that you were able to transcend your death prophecy? Anand Mehrotra: Awareness is your deep capacity to detach. To become aware that you are a witness. That there is a presence inside of you that is beyond all movements. That presence that is beyond the thoughts, physiology, circumstance, irrespective of what’s happening around… when you become open to that possibility, that is the dawning of awareness. I am not my thoughts, my feelings, my emotions, my history, my future, my job… I am none of it… that’s the beginning of awareness. You are alive right now because of that awareness, but you are not aware of that awareness. You think you have to struggle. Instead of detachment we create disconnect. Awareness is the beginning of the question: Who am I? And what is the Truth. In this very moment as you are reading this article, right now pause and become aware of that silence inside of you. Go deeper into it. And you will expand. All it needs is you to witness. Now I call it Aware Crazy Grace. Transcendance of the prophecy was through this aware crazy grace. Not separate. Atoms and molecules are not separate. Molecules and tissues are not separate. They are just making love. And yoga is just making love. So molecules are being in yoga. And when we talk of awareness it’s not “my” awareness. It’s awareness. And then as I said, the awareness is you connecting to your true self, then that is grace. YT: Your mission at Sattva Yoga is to grow masters, not just teachers. Can you explain how a master is different than a teacher? Anand Mehrotra: A teacher informs and a master transforms. A master’s intention is to transform and the teachers intention might be just to inform. That’s the big distinction. So the intention in Sattva yoga is to create a radical shift and transformation of the being. Yoga is alchemy. Guru means master. Now more teachers. Teacher can sometimes be bound by the teaching. The master is not a master because he teaches. Master is master because of the way he lives. It’s not bound by who you teach, how many, celebrities, where you teach… these are products of mind. Master is not lost in this. You might not even teach in conventional sense, but the very being is vibrating on the frequency of yoga. His or her purpose here is to awaken, not in the future, but now. So my vision with Sattva is to inspire people to really come into their own mastery. Live as a master irrespective of what they do. Swami means one who has mastered oneself, one who has awakened to oneself. Then whatever will originate from that state of consciousness will be a transformation - be it cooking food, riding a motorcycle, teaching yoga, helping kids grow, or making love, whatever you are doing. YT: If the prophecy had come to pass during the filming of the movie, what was the final message you would have wanted to leave with the world? Anand Mehrotra: Wake up now. The only thing you have is time and the only thing you don’t have is time. Your purpose here is to evolve, do not settle for anything less. You have a diamond in your hands, do not throw it away. YT: You are still in your twenties and by now you are supposed to be dead. What do you want to do with the time that you have? Anand Mehrotra: I’m already dead right now also. In this moment I am dead, born, beyond death, 18, 20, right now. What I want to do in this eternal now is to express; live a life of deep expression of the awakened self. One of my students said that I was in her dream and I was standing in the river and I said, “I am a wolf, hungry for transformation.” So for me the passion is to create opportunities for transformation. A passionate life, nonviolent celebration of love, intelligence, and of silence… that is why I am here… to expand that possibility. Be it through my foundation for kids at the Kushi Foundation or through the Sattva Center.